We are the first and only Pilates Studio in Singapore that provides functional Pilates classes created specially for the Desk-Bound Workers, Athletes and Youth. Pilates was developed by Joseph H Pilates (1880 – 1967) and originally named as Body Contrology. Joseph created “The Pilates Principles” to condition the entire body, focusing on proper alignment, centering, concentration, control, precision, breathing, and flowing movement. Today, sport doctors, physiotherapists and fitness professionals around the world are constantly improving the original set of more than 500 Pilates exercises to cater to the needs of different population groups. Pilates has evolved to become an unique exercise that aim to strengthen core muscle, even out muscle imbalances and enhance sports performance. We provide both Pilates Reformer and Mat Pilates classes in group and private classes. Click here read 5 Top Reasons Why Customers Prefer Pilates Fitness To Other Gyms & Pilates Studios. Pilates Fitness Reformer Group Class utilised Reformer machine to offer hundreds of Pilates exercises to your Pilates workout. Pilates reformer exercises have no-impact on your joints. It tones your muscle more than a mat class as there is increased resistance from the Reformer machine. We also offer Pilates Reformer Jumpboard classes for increased intensity with an extra OOMPH! Mat Pilates Class utilised your own body to provide resistance for an head-to-toe Pilates workout. Various props such as toning balls, flex bands, foam rollers and resistance circle are used to add resistance and challenges. Mat Pilates classes focus more on abs and spinal work and less on your limbs. Private Pilates Classes are suitable for clients with health issues or specific fitness goals. We provide posture analysis and consultation to understand your needs. Thereafter, we customise Pilates exercises to meet your objectives; and review the progress after every class. You can also choose the instructor, the day and time of the workout at your convenience. We provide FREE 30 minutes Pilates Reformer Introduction Class before every Pilates Reformer Class to prepare you for your Reformer workout. Clients are not able to attend the Pilates Reformer Introduction with out attending the Reformer class immediately after. 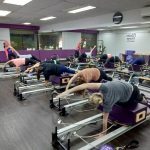 Reformer Introduction Class introduces you to the various Pilates Reformer features and how to use it safely and effectively so that you can get the maximum out of every Pilates Reformer class. It is 50% theory and 50% practise. It is compulsory for newbies to attend at least 1 Introduction Class before going for your regular Reformer Group classes. Almost everyone experienced backaches and stiff shoulders at some point in their lives. Pilates is the only method proven successful to alleviate pains and increase functional strength. Pilates For Core & Body Aches is suitable for anyone who wants to strengthen their core muscles and reduce muscle tensions. Pilates Jumpboard gives you extra cardio boost during your Pilates class. For those who find regular Pilates classes too “slow” for comfort, the Pilates Jumpboard will give you a lovely surprise. However, this class may not be suitable for people with knee and ankle issues. In the Pilates for Runners class, we work the body by mimicking movements of the body when one is running; thereby strengthening the supporting muscles to reduce chances of injuries and muscle imbalances. It is an excellent cross-training tool to boost your athletic performance. The ability to maintain the posture before and after the swing, and the swing itself is key in performing well in a golf game. We work the body by mimicking movements in a golf game and strengthen supporting muscles so that there is less chances of injuries. Pilates for Golfers is suitable for Golfers who are still not performing in their game despite going for professional training. Youth increase their overall body awareness, promote good posture and learn proper breathing techniques – all which will help with reducing stress from school and examinations. It is highly recommended especially youth athletes, youth dancers, youth looking to lose puppy fat and youth recovering from injuries. Pingback: Can Pilates Really Help Me To Lose Weight?